“Informa Telecoms & Media is delighted to reunite the global SDN & Network Virtualization community for this comprehensive SDN and NFV event for the carrier community, packed with case studies from the pioneers at the very forefront of SDN and NFV advancements worldwide. 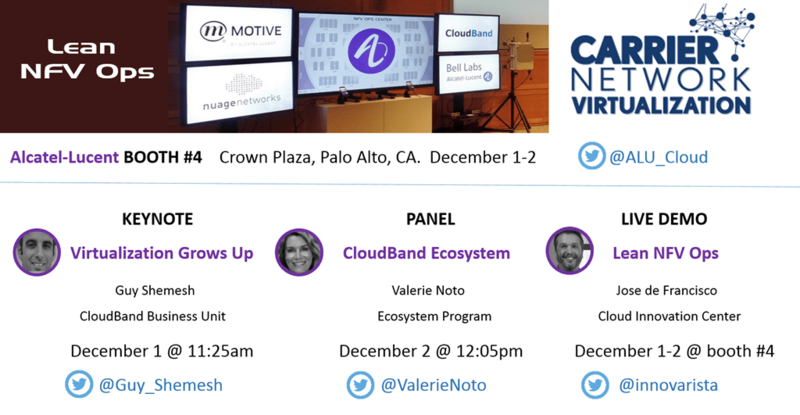 Set in California, the heartland of SDN & NFV solutions, Carrier Network Virtualization brings the industry together to discuss Carrier Class SDN from a unique strategic carrier-led perspective.” – Alcatel-Lucent Events Site + FREE CARRIER PASS! 2015 is not yet over but as we approach the year’s end I can already share that this was a very intensive year for the Lean NFV Ops Roadshow. By the way, that was true from the get go: our success at Mobile World Congress triggered an immediate and, most importantly, lasting chain reaction. CNV15 is my last stop as far as industry events for this year, while we keep going strong with private workshops for network operators. Speaking of which, I need to credit the good work of our team in Mexico for all efforts that went into the sessions we delivered a couple of weeks ago in partnership with Bell Labs Consulting. Quick side note: Hurricane Patricia, the most powerful cyclone ever, got downgraded as it greatly weakened at landfall, though we managed to experience some pretty weird hailstone storm in Mexico City. The fact is that Mexico was kind to our team and we couldn’t be happier about customer feedback received during and soon after the workshops. Now back to CNV: our conversation on Lean NFV Ops synthesizes learning capturing a wealth of insights acquired in face to face discussions involving 1,500+ worldwide individuals (network operators, partners, analysts and public officials) engaged in this year’s roadshow. Our two-way sessions with network operators and, sometimes, three-way activities involving partners have doubled as first hand primary market research with substantial critical mass. We have not only managed to validate Lean’s value and our holistic approach to operating NFV in today’s environment, but also followed up on invaluable customer insights. That kind of interaction has shaped up a virtuous circle making the Lean NFV Ops program an industry asset transcending our work. If interested, feel free to stop by our CNV15 booth, though it is best to work with our team in advance to get a session scheduled. Looking forward to seeing you in a couple of weeks in Palo Alto.